The great German conductor and pianist,Wolfgang Sawallisch passed away at his home in Grassau, Germany, Friday February 22, he was 89. Sawallisch was known for his consistently great interpretations of the German Romantic Tradition in classical music, especially the music of Richard Strauss and Richard Wagner, as well as the music of Anton Bruckner, and to lesser extent, Gustav Mahler. Sawallisch was a prodigy at the piano and began playing at age 5. By the time he was 10, he had already decided to be a conductor. He studied piano, composition and conducting, but his studies and career were interrupted by the war when Sawallisch was drafted into the army; he served as a radio operator in the Italian theater. He was captured by the British, and composed two string quartets while a POW. After the war, he was able to complete his studies and find work as an opera coach. He quickly made a name for himself as a young opera conductor. In a demonstration of integrity, Sawallisch turned down offers to conduct the Vienna State Opera and the Metropolitan Opera. He felt he was too young to take on those challenges. Later, he would go on to conduct some of the greatest orchestras in the world, including the Philadelphia Orchestra, Vienna Philharmonic, London Symphony, Concertgebouw Orchestra, and he was the youngest person to ever conduct the Berlin Philharmonic. Sawallisch worked with the top artists of his time, including Yo-Yo Ma, Stephen Bishop-Kovacevich, Sarah Chang, and he often would play the role of accompanist to such super-stars as Elizabeth Schwarzkopf and Dietrich Fischer-Dieskau. As conductor, he also championed and premiered many works by 20th century composers. Sawallisch was director of the Bavarian State Opera from 1971 – 1992. At 70 years of age, he had grown tired of the criticisms that he was too conservative and resigned. He might have been expected at this time and age to slow things down a bit, but his career took a surprising turn. He was asked to become the music director of the vaunted Philadelphia Orchestra, replacing the much younger Ricardo Muti. To some, this decision seemed backwards, given Sawallisch’s reputation for being too conservative. But in the event, the new position galvanized both Sawallisch and the Philadelphia Orchestra. This was not just a rest-in-place position for an aging once-big-name conductor. He would hold this post for a decade and make several major changes and improvements to both the orchestra and their concert programs. During his first years, he replaced a third of the orchestra personnel. And contrary to his stodgy reputation, he would include premieres of many contemporary works; their 1999-2000 season was comprised completely of 20th century music. After his tenure in Philadelphia, he retired in 2003. He gave few concerts after this, retiring to his home shortly thereafter. 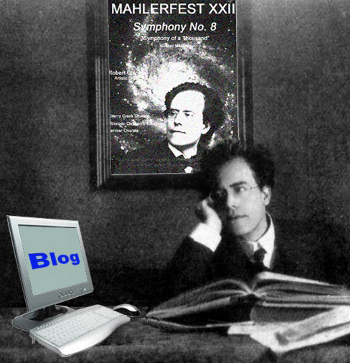 This entry was posted in MahlerFest, News, Ron Nadel and tagged Anton Bruckner, Classical music, Colorado MahlerFest, Gustav Mahler, Richard Strauss, Richard Wagner, Ron Nadel, Sawallisch. Bookmark the permalink. Sawallisch was a fantastic conductor. I love his Bruckner. Another great Brucknerian was Eugen Jochum- have you heard his interpretations? We definitely agree with you on Jochum’s Bruckner, his series of Bruckner DGG LPs from the 60s are all terrific. His Brahms symphonies (mono unfortunately) and piano concertos (with Gilels) are also in a class by themselves. We wonder why he hadn’t recorded more.